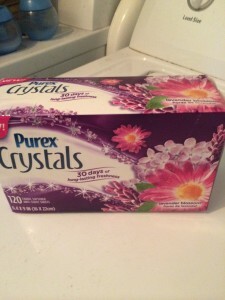 I love using the Purex Crystals in my washer and now Purex has a dryer sheet that has 30 days of long lasting Crystal freshness. Purex Crystals Dryer Sheets don’t just reduce static cling and leave your family’s laundry soft and smelling fresh: They can also keep your whole house smelling fresh for weeks not days! I found that not only do drier sheets make your laundry smell good but you can use them all over the house. I like to tuck a drier sheet under one of the couch cushions. I also like to put one in the vacuum bag – it really smells good when Rex vacuums. I noticed how good these Purex Crystal dryer sheets are when I put the box in the laundry area. When I walked in the room I could smell the great Lavender Blossom scent. It wasn’t over powering it just smelled good. The Purex Crystals Sheets also come in Fresh Spring Water. There are so many different ways to use these dryer sheets. Stinky shoes? stick a dryer sheet in them at night ~ next day nice and fresh. Static in your clothes? Wipe a dryer sheets across the area and static is gone. I have a dryer sheet in my underwear drawer and in the cupboard under the sink. My whole house smells good and the scent last for 30 days! You can find these great smelling Purex Crystals Dryer Sheets locally in your laundry aisle at your favorite store. Stay connected with Purex on Facebook. Are you feeling lucky? Give your clothes a kick of freshness with Purex Crystals Dryer Sheets. Purex Crystals Dryer Sheets give your clothes 30 days of long-lasting freshness! Enter for your chance to WIN $500 and a year’s supply of Purex Crystals Dryer Sheets! Hurry ends May 9, 2014. In addition to the grand prize winner, fifty (50) will WIN a FREE box of Purex Crystals Dryer Sheets. Enter HERE. I also received 3 coupons to share with 3 lucky readers of Kaisy Daisy’s Corner. You must be 18+ US. Leave a comment on how you use dryer sheets other than in the dryer. Extra entry for following Purex on Facebook. Extra entry for each way you follow Kaisy Daisy’s Corner. Giveaway ends May 15, 2014. Enter daily for more chances to win. Please fill out the form HERE to enter. I put them in my drawers to help keep clothes smelling good. Dryer sheets are great to have in your gym bag to keep things smelling fresher! I carry one in my purse -you can stop static cling on the go. I like that you can put them in tennis shoes that get smelly and make them better! I like to use dryer sheets in my dresser drawers and under the seat in the car. I am a confirmed email subscriber. Love using them in my drawers as a smelling good scent. I put them in the fabric of my couch cushions. I put dryer sheets in the dresser drawers..keeps everything smelling fresh!! i have tried them to keep mice away but it doesnt work! Willing to try something new. These dryer sheets are great. I use dryer sheets in most of our dresser drawers to keep everything smelling fresh. Sometimes I use them in my closet or dresser drawers to make my clothing smell good. When i replace sheets on the beds i slide a couple under the bottom sheet. The smell lasts a long time. I put them in dresser drawers. I always put one in the dirty clothes basket. i use dryer sheets to clean my baseboards. The only dryer sheets I will use. I put one in my car. I put them on the closet shelf. I slip one in my pillowcases. I have stocked up on these. Thirty days of great smelling clothes and even shoes. I actually put one in the glove box of my car. I put them in the box I store winter clothes through the summer. I put them in my dresser drawers. I put them into my husband’s stinky shoes! I put one between the sheets in the guest ved to keep them smelling fresh. I place them in my vacuum bag!! Love them in my dresser. Keeps lingerie smelling nice. Bedding comes out so fresh. Another way I use dryer sheets, in addition to using them in the dryer, is I keep them in dresser drawers so clothes will smell fresher. I put one in my car air vent. Keeps the car smelling great.